The Kitchen Trials | Me vs. the Kitchen. With No Supervision. Me vs. the Kitchen. With No Supervision. Lately, I’ve been making more of an effort to cook dinner at home and to prepare meals that’ll make good leftovers for lunch at work. My cookbook and magazine habit has been pretty darn helpful in this effort. In particular, I’ve been ripping out roughly half of the recipes in Southern Living and Bon Appetit lately. And I’m even using the recipes. Well, some of them. Others are stacked very neatly just waiting for their turn. But they’re going to have to wait a while, because this recipe for One-Pot Pasta with Tomato-Basil Sauce from Southern Living is my current favorite. In about two months, I’ve made it four or five times. And for a recipe that serves six that means I’ve basically been eating it every other day. I will say, don’t substitute the spinach for broccoli; it doesn’t quite work. Also, use a sturdy pasta that does well when cooked for a while. 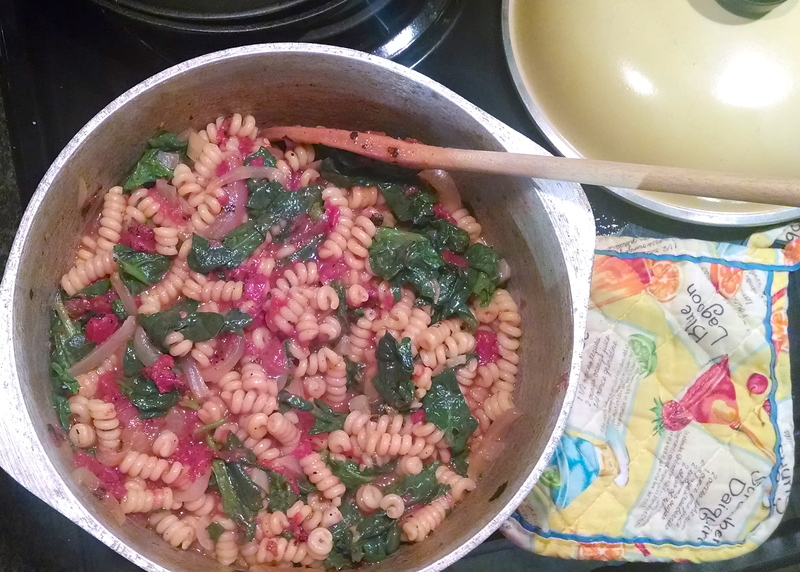 I use De Cecco’s Fusilli Corti Bucati, which has a 15 minute cook time (according to the box). I’ve tried a couple of other pastas, but they overcook or get a bit gummy. This pasta cooks up nicely and gives the dish an almost creamy texture. When serving this dish, top it off with a grated hard cheese like Grana Padano or parmesan. You’ll be good to go for dinner and maybe have a dish or three leftover for lunch, too. It’s been nearly two months since my Dranny, Lovetta Childs, passed away on July 7. In the past couple of weeks, I’ve been able to find some new sense of normal, but there are times when the grief hits me unexpectedly and leaves me with tears running down my face. Sunday mornings are the hardest though. It’s the day of the week when she passed and Sunday mornings are so quiet that there’s almost no chance that the memory won’t come directly to mind. So I’m left reliving the morning when she passed and wondering when exactly the pain of the grief might subside. I try to remember happier memories of my Dranny whenever possible. So at times like this, I try to replace the memory of the morning she passed with the memory of the morning I was with her in ICU after staying overnight with her. She had woken up at 4:30 or so and asked me whether or not I had the coffeepot set up for the morning. Something that was always a concern in our house because my Dranny needed her cup of coffee first thing. In fact, I’m pretty sure I inherited my caffeine addiction from her. I assured her the coffee would be ready first thing and that I had our cups all ready, too. Later that morning, she was alert and responsive, and she had improved dramatically. In fact, the ICU nurses were expressing cautious optimism that she’d be out of ICU in no time at all and back home within days. That morning, I stayed with my Dranny and we had our cups of coffee, gossiped and fought over whether or not I was going to share her eggs. She won. I shared in the misery of eating what I’m pretty sure was plastic masquerading as scrambled eggs. But by gosh, we were having coffee, gossip and breakfast together, and it was my time with my Dranny and it reminded me of all the mornings that she and I had sat on her patio or at the kitchen table having a cup of coffee before everyone else was up and at it. Those quiet mornings when we would talk about anything, everything or nothing at all. Those mornings are part of my collection of precious memories of my Dranny. This morning, I’m sitting on my patio. Drinking coffee out of the cup I keep at the house just for her. Because my Dranny only drank coffee from her Fire King cups. And I’m remembering how lucky I was to have had her in my life for so long as I did. Sitting on the patio and enjoying a cup of coffee in one of my Dranny’s beloved coffee cups. You can take the girl out of Texas, but you’ll never take the Texas out of the girl. This is a phrase that perfectly describes my friend Amber of Bluebonnet & Brownies and so many of us that do or once did live in the Texas diaspora as Tex-pats (you know, Texans that are living outside of Texas). We became friends when I was living in Nebraska and quickly learned that we could share a laugh, a hug, a Shiner Bock and some barbecue – no matter the distance between us or the distance from Texas. Nowadays, we continue to share a love of Texas and especially the Hill Country, where bluebonnets grow wild and blanket the countryside in the spring. I’m lucky enough to live in Texas again and can share snippets of these moments with Amber, who is still living in the diaspora. Today, though, I get to celebrate Amber’s Texas Baby Shower with her and all y’all. I’ll be honest, I had planned to make Coca-Cola Cake because I thought that would be fun. But Coca-Cola Cake is a new-to-me recipe and I realized that I wanted to share a recipe that had some family history for me. Banana Pudding is a familiar recipe for just about anyone I know. Which one of us, especially us Texas kids, didn’t dig into a dish or three of it at family gatherings or church potlucks? And in my family, my Dranny would make it special for us kids by serving it up in her gold goblets that she passed on to me. Lately, these memories have been precious to me. And as we celebrate Amber’s first baby, thoughts of family and happiness together should be shared and passed on. Amber (and your Brit! ), you’re going to have an even more beautiful family with the addition of your little bluebonnet baby. Congratulations! In the serving dish (or dishes) of your choice, layer vanilla pudding (or chocolate, if you’re feeling crazy…), banana slices and Nilla Wafers together. The ratio of pudding to bananas to Nilla Wafers is your choice. 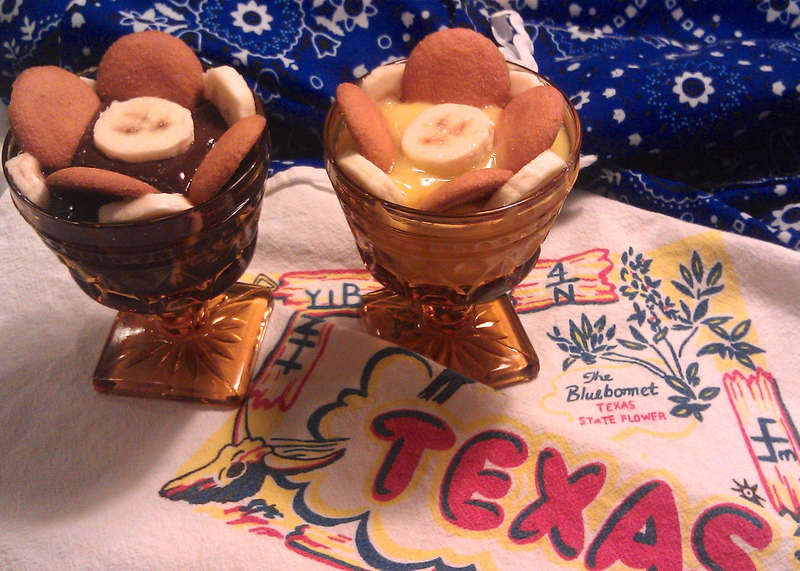 Two things to keep in mind, the Nilla Wafers will get soft and smooshy as they absorb the pudding, and the bananas will get a little brown if they’re not covered with pudding. For that reason, I assemble mine in individual serving cups right before serving. But if you’re going to a potluck, layer the bananas on the inside and lay the Nilla Wafers on the top. If you like. Be sure to check out posts from others who are helping celebrate Amber’s Texas Baby Shower today! Baby is not a living, breathing thing. Baby is my Mom and Dranny’s trusty wooden spoon that is probably older than I am. It has scorch marks, dings, dents and all kinds of so-called imperfections that make it perfect for making supper, stirring cake batter or mixing up a big ol’ batch of potato salad. It’s been burned when a roommate left it in a pot too long. It has cut marks along the handle from where I used it for some cooking experiment. And it is the perfect size for all kinds of recipes. Until recently, the one spoon was enough. And then my Dranny offered to let me go through her spare utensil drawer. 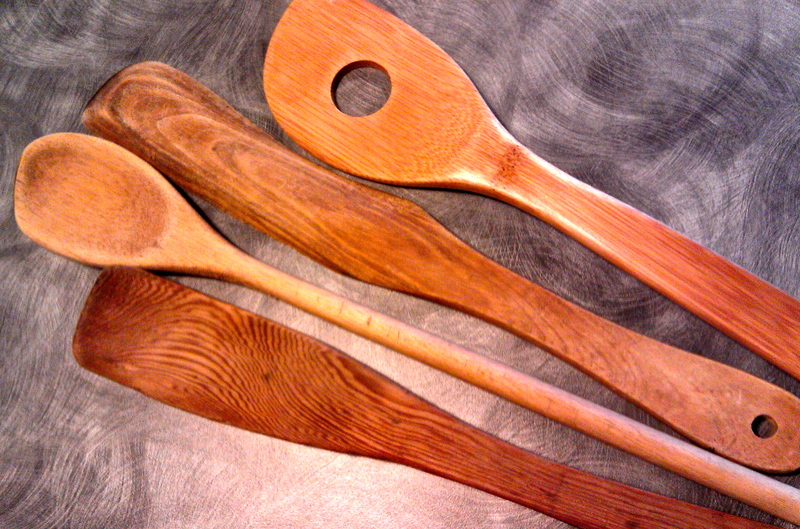 My favorite wooden spoons. From bottom to top: A spatula, my “baby,” another spatula, and my bread dough spoon. Folks, I do not exaggerate when I say I spent a good hour or so going through the drawer deciding what I could use versus what I wanted to take home with me just because I knew my Dranny or Mom had picked it out and used it. I figure that maybe, just maybe, using one of their old spoons would bring a little of their cooking magic into my own kitchen. I officially adopted several spare utensils, but my favorites are the wooden spatulas and the bamboo spoon I brought home with me. My original spoon is an all-purpose work horse. The wooden spatulas are perfect for stove-top cooking, especially when I’m using my cast iron skillets. And the bamboo spoon, with its well-placed hole, is just the thing for mixing up bread dough. But even if I wasn’t using these spoons regularly, they’d still have an honored spot in my kitchen because having them close by is like having a little bit of my Mom and Dranny with me in the kitchen. And, when it comes right down to it, that’s what matters most to me. Sometimes, a simple supper on the patio is the best kind of supper there is – especially during the summer. Crab salad served on endive and with a Topo Aperol, too. I’ve shared a version of the crab salad before – as inspired by trip to Maine, where I was avoiding the lobster like the plague it is. I did things a little differently this time just because I could (recipe below). I also recommend making yourself a simple cocktail. In this, I had a Topo Aperol, which is about one part Aperol Liqueur (an Italian aperitif) to 3 or so parts Topo Chico (a sparkling mineral water that you must love if you live in Austin). Mix all ingredients together. 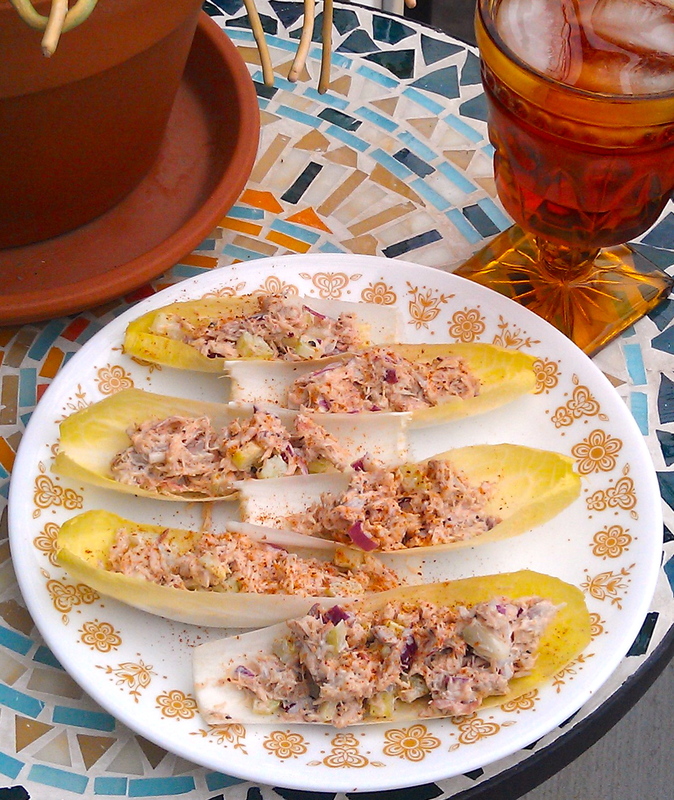 Serve on endive leaves. Enjoy with a Topo Aperol! And so it begins. The season of the tomato mayo sandwich. I like a lot of foods, but I really like tomato mayo sandwiches. But only when tomatoes are in season and they’re super fresh. If past summers are anything to go by, it’s likely that I’ll eat a tomatoes worth of sandwiches just about every day for the next month or so. To shake things up, I’ll make a tomato bacon pie or a BLT. But, really, that’s a whole lot of work and the near instant gratification of a tomato sandwich is nearly more than I can resist. And, if you don’t know what I’m talking about, then here’s what you need to do. Go out and get the freshest tomatoes you can find. Do not refrigerate them. Get some bread (a soft white bread that doesn’t have to be toasted is recommended). Grab a jar of Duke’s Mayonnaise (or Hellman’s or Best, if you insist). Slather some mayo on the bread. 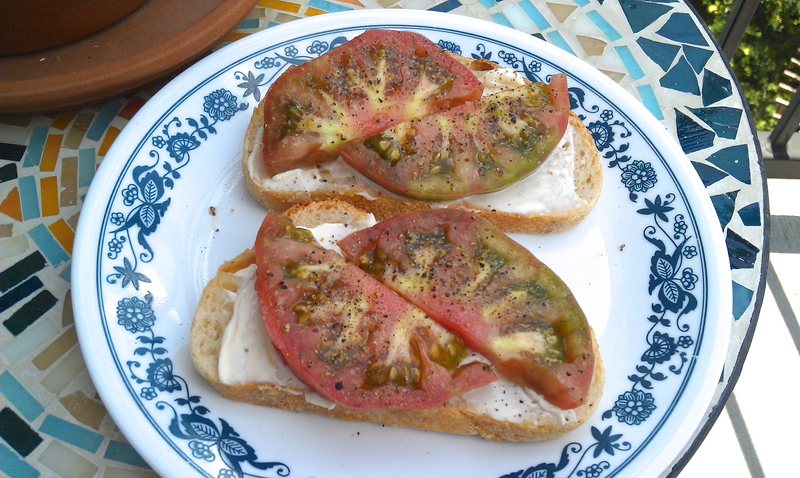 Cut the tomatoes in nice, thick slices (no pansy slivers of tomatoes here!). Layer the tomatoes on the bread. Season with salt and pepper. For true sandwich approach, top with another slice of mayo-slathered bread. Or for maximum tomato to bread ratio, leave it open-faced. Now enjoy that sandwich and keep a napkin close by to clean up the juice that’s likely to drip down your chin. 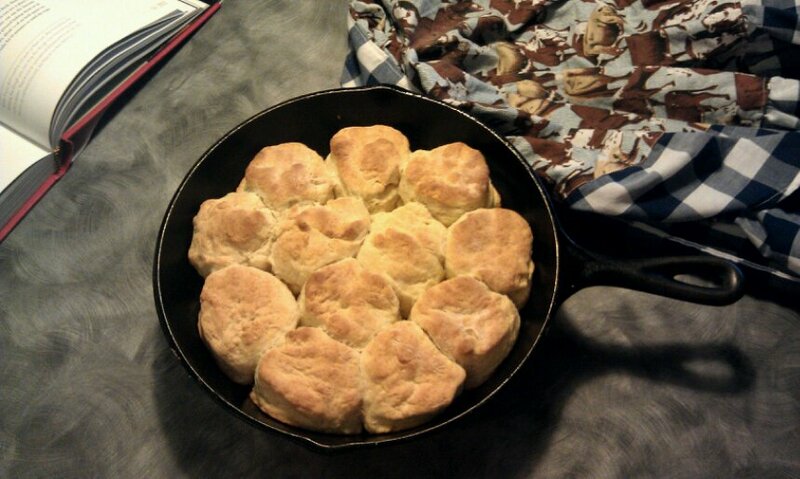 Homemade biscuits baked in my mom’s cast iron skillet. Oh… And an apron with cows and gingham check that my mom made for me. I used Lisa Fain’s recipe from her Homesick Texan cookbook for these biscuits. You can find Lisa’s recipe and a photo tutorial online courtesy of CNN’s Eatocracy. Enter your email address to subscribe to this blog & receive notifications of new posts by e-mail.